Like a lot of modelers, I have my fair share of "shelf queens." For a long time, this was something I had actively avoided, but as of late, I'm finding it more difficult to finish projects. Right now, I have six tanks/SPGs on my desk—I only photographed five of them—in various stages of production so let's have a look! First up is the M3 Lee from Takom. 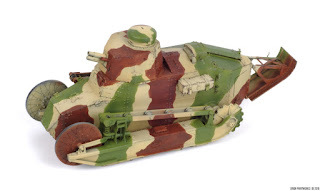 The Lee is probably my favorite tank just based on how funky it looks and to be honest, it was quite a good tank when it debuted in British service during the North African Campaign. This Takom kit is pretty good though not without its faults. The hull facets can be troublesome, but with a little patience and test fitting, they'll go together without too much difficulty. I replaced the kit barrels for the 75mm main gun, the 37mm turret gun, and the M1919 machine guns with turned aluminium and brass, respectively. The worst part of this kit is the length-and-link tracks because they're about half a link too short. They really killed my mojo on this kit but I've since replaced them with aftermarket workable tracks that have to be assembled, which I'm not looking forward to doing. I'm a big fan of self-propelled guns and the Soviet ISU-152 is one of the coolest ever built. 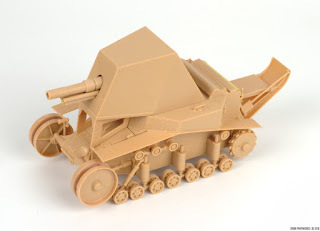 This Tamiya kit is as good as any modern Tamiya on the market. Of course there are places with the detail could be better and the engineering has been simplified, but it builds up quite nice. I also replaced the kit barrel with a turned aluminium barrel because I prefer them over plastic. This was also my first go with Mr Paint lacquers and I liked them a lot. I stalled on this because I was vexed over how to proceed with the weathering and this kit offers a great platform for that. This little kit is for my Bolt Action Soviet army. I'm not a big fan of weathering on gaming models, but since it's a tank for a historical game, I'll add a little bit. It's difficult to add mud and dirt to a model that will be handled, but I'm sure I'll figure it out. I used the new AK Interactive Real Color paints on this kit and they've really started to grow on me and I absolutely adore this shade of olive drab. I'm a sucker for ugly inter-war tank designs, and the SU-18 definitely fits the bill. 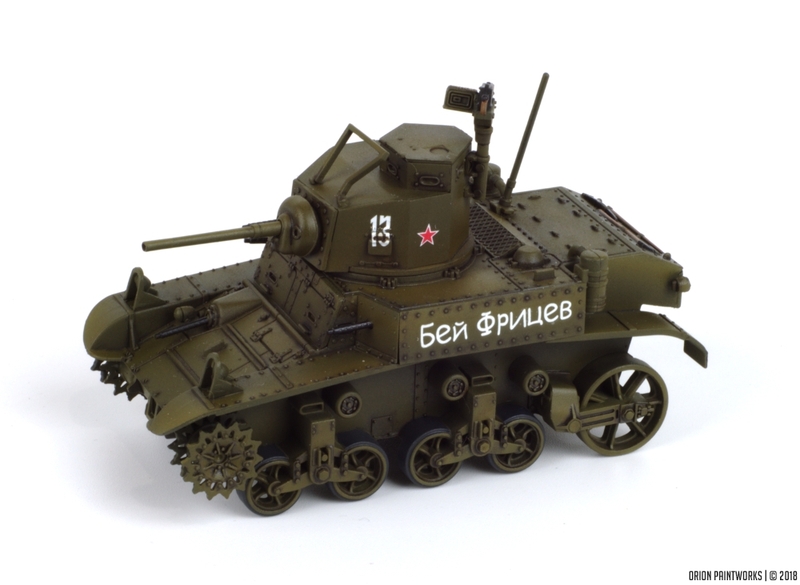 Based on the T-18, the first Soviet designed tank, the SU-18 mounted the M1927 76mm regimental gun in a non-rotating casemate. The SU-18 project was abandoned in 1930 before any working prototypes could be built. This was my first HobbyBoss kit and I like it well enough. The instructions weren't the best and I ended up building the the idler wheel on the right side wrong but I don't think it will matter in when the tracks are on the running gear. Following my entry into AFV modeling, I bought a bunch of World War I-era tanks. One of the coolest ones, the diminutive Renault FT, has been wonderfully reproduced by Meng. 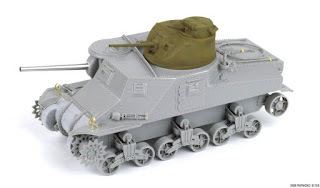 There are two version of this kit available: the cast Girod turret with full interior and the riveted Berliet turret version with a neat diorama base. I have both kits and decided to start with the riveted turret version to avoid doing the interior. The kit built up nicely and the fit was pretty good, with a little care needed to make sure all the hull facets align properly. What killed me on this build was the paint job; it was my first attempt at multi-color camouflage and I wasn't really happy with how it turned out. I tried to fix it a little bit with some filters but that made it worse in my eyes. This model is probably the closest to completion out of any of my shelf queens and I'd really like to get this one done but it remains to be seen if I could do that without a complete repaint.